Today marks the official release of Wilco's newest disc, but as with their past two releases, I've been listening to it for 4 or 5 weeks now. However, unlike their previous two albums, I didn't really require that much time to come to my final judgment of this record. Wilco (the album) isn't a grower, it's the band's most accessible album to date, a sonic portrait of a band that seems very comfortable with the kind music they choose to make. It's easy to look at this collection of mostly sub-four minute tracks and see Wilco (the album) as a throwback to the days of Summerteeth, when Tweedy's somewhat dark lyrics were balanced out by poppy arrangements. Supporting this assessment are a good amount of interesting lyrical choices, from the homicidal tale of "Bull Black Nova" to the apocalyptic lament of "Country Disappeared". However, one can also find throwbacks to the Yankee Hotel Foxtrot era in the densely layered and oftentimes noisy "Deeper Down". Pieces of the more artsy sound of A ghost is born crop up in the krautrock swagger of "Bull Black Nova". I'm reminded of the classic rock sounds of Sky Blue Sky by the jaunty upbeat "Sonny Feeling" and the all-out rocker "You Never Know". You can even hear hints of the more straight-ahead alt-country sound of Being There hidden somewhere between the pedal steel and acoustic guitar of "I'll Fight". Wilco (the album) draws from the group's entire history, combining these diseparate threads into something that is at once unified and divided, strange yet familiar. 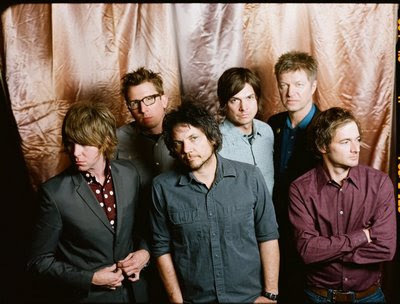 Take the album's opening track "Wilco (the song)", a tongue-in-cheek, self-referential tune that shows a fun side of the band that hasn't been prominent in quite some time. Just take a look of that picture of Tweedy winking to the camera in the liner notes and you'll see what I mean. And what better way to flesh out a goofy ode to oneself than with some great droning guitar work care of Nels Cline? Also of note is "One Wing", which is one of the best straight-ahead pop songs Tweedy has penned in years. With its soaring choruses and interesting rhythms, it's the kind of song I've been wanting to hear from the group for a while. To me, these to songs sum up where Wilco is now, and perhaps where they're going. This is one of the most reassuring records I've listened to in a while. After many years of turnover there is finally a cohesive group at the center of this band; you can hear it. Wilco (the album) is the culmination of 15 years of music from a group that hasn't been afraid to change its tune, and one that will hopfully grace us with a few more records as great as this.